Welcome to Dunaverty. The name is Gaelic and several interpretations have been suggested, including Dun Abhartaigh, the Fort of the Abhairtach, an ancient powerful tribe. Gaelic was the customary language in Kintyre from about the 5th Century AD until the 17th century, when Scots-speaking families from Ayrshire and Renfrewshire were settled in the southern part of the peninsula. There were still a few Gaelic speakers in Southend even into the mid-20th century. Dunaverty was an obvious choice for fortification. Formed of conglomerate rock, it is a natural stronghold, being protected on three sides by cliffs and sea. The summit is accessible only from the north, across a narrow path. As a fortification, Dunaverty has had a long and interesting history. It is first mentioned in The Annals of Ulster, which record that Aberte was besieged there by Sealbach, King of Dalriada, in AD712. About 1250, the castle was stormed by John Bisset in the service of King Henry III of England. In 1263, it was garrisoned by King Alexander III of Scotland against the invasion of King Haco. It was, however, surrendered to Haco, who placed it under the command of a fellow-Norwegian, Guthorm Backa-Kolf. The castle, a little later, was taken over by Angus Og MacDonald of Islay and Kintyre, who there entertained Robert the Bruce for three days in the Autumn of 1306. It was captured, soon after, by the English, who had expected to find Bruce there; but he had already made his escape. Angus Og – Young Angus – advanced the fortunes of the powerful Clan Donald by backing Bruce at the decisive Battle of Bannockburn in 1314, commanding the men of Kintyre and Islay. Clan Donald, however, as Lords of the Isles – and Kintyre – was to come increasingly into conflict with the Scottish Crown, and was finally dispossessed of its lands in 1493 by King James IV. In the following year, King James stayed at Dunaverty Castle, which he re-fortified with cannon and in which he installed his own governor. In an astonishing act of defiance, Sir John Cathanach MacDonald, who had expected his Kintyre lands, and the castle itself, to be restored to him, took the castle by surprise, with only a small body of men, and hanged its newly-appointed governor over the walls in full view of the King, who was offshore in his boat. MacDonald then fled to the Glens of Antrim in Ireland – a customary bolt-hole for Clan Donald renegades – but was subsequently betrayed by a kinsman and hanged along with other members of his family. But the most horrific episode in the castle's bloody history was still to come – the infamous massacre which took place there in June of 1647, when both England and Scotland were being torn apart by civil war. The Royalist army of the legendary warrior, Lieutenant General Sir Alexander MacDonald – in Gaelic, Alasdair MacColla – being pursued and harried by the Covenanting force of General David Leslie, split in two at Rhunahaorine in North Kintyre. MacColla and many of his men escaped to Islay in boats, while the remainder continued south, under the command of Archibald Mor ('Big') MacDonald of Sanda. They went as far south as they could, which was Dunaverty Castle, and there awaited their fate. It was to be a hard fate. Leslie and his army laid siege to the castle and immediately cut off its water-supply by capturing an outer ditch or defence. When the garrison surrendered, a few days later, it was massacred with few exceptions. Most of the estimated 300 men who had been holed up in the tiny castle were from Kintyre and other parts of Argyll, and included many MacDougalls. The young grandson of Archibald Mor MacDonald, according to local tradition, was smuggled to safety by his nurse, Flora MacCambridge. The infant's father, Lieutenant Colonel Archibald Og ('Young') MacDonald, was killed later that year in the Battle of Knocknanuss in Munster, Ireland during which Alasdair MacColla himself was also slain. Dunaverty Castle is thought to have been demolished in 1685, thus ending a long and distinguished history. Visible remains are scant, but on the south-western face of the rock a small section of lime and rubble wall, probably built to block a potential route of ascent, can be plainly seen. 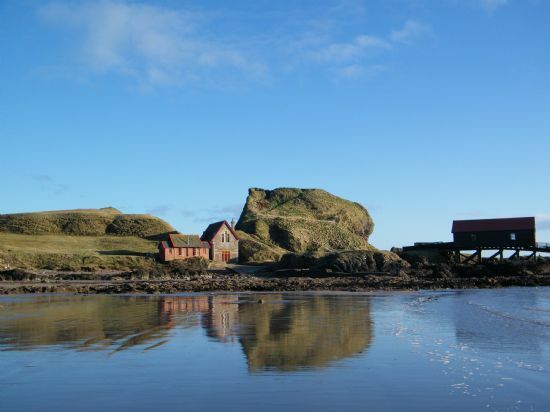 The next substantial structure at Dunaverty, that we know of, was the National Lifeboat Institution's lifeboat station, built in 1869, and still in place. The building has two stories. The lower one housed the lifeboat and the upper one accommodated the coxswain and his family. The first coxswain was John Gillon, an Irish-born fisherman who was brought up in the village; but the entire crew, latterly, came down from Campbeltown in a brake to answer call-outs. The coxswain in 1906 was Henry O'Hara and the second coxswain, Charles Durnin, both Campbeltown fishermen. Both the station itself and the first Southend lifeboat, the 25 ft-long, 10 oared John R Ker, were presented to the NLI by Mr Robert Ker, merchant, of Auchinraith in Lanarkshire, in memory of his son, who was drowned, while duck-shooting in Ronachan Bay, in north-west Kintyre. The memorial tablet is still in place in the front of the Boathouse. The larger boathouse (demolished by the elements) and slipway (derelict), closer to the Rock, were constructed in 1904 to accommodate a larger (38 ft) lifeboat, again named the John R Ker, the original slipway having been found to be useless in particular conditions. This defect was highlighted in February of 1903, when the Norwegian barque, the Argo, grounded on the Arranman's Barrels reef and the Southend lifeboat crew 'battled for hours' to launch their boat, but time and again the craft was thrown upon the beach by the great waves thundering upon the sands'. The surviving crew-members of the Argo were finally rescued by the Campbeltown lifeboat. After motor-power became established in lifeboats, thereby increasing their speed and range, such outlying stations as Dunaverty became obsolete and were closed down. In 1989, the present owner of the Boathouse donated the station's hand-operated winch and a Lister diesel engine to the Scottish Maritime Museum in Irvine. The present owner of the Boathouse is a local man, who works from Dunaverty. When he purchased the property in 1982, it had lain derelict for many years, lacked running water and sanitation and was in need of extensive renovation, a process which is still going on. The distinctive structure on the seaward side of the Boathouse was originally a store and boiler-room. Its renovation began in 1996 and it incorporates several interesting features. The triangular copper window came from a lighthouse and the porthole was salvaged from a Belfast coaster, the Gracehill, which grounded on the Boiler Reef, off Sanda Island, on 8 March 1957, while on passage from Londonderry to Ayr. The Captain, James Smith, and his crew of nine, were rescued, but the 162-ft vessel could not herself be saved. On the west side of the outbuilding, a sandstone tablet, carved by a visiting Dutch artist, Jan Lageweg, incorporates- fittingly – a symbol of compassion for all beings. The Tibetan prayer-flags, visible around the buildings, carry good wishes, which are dispersed by the winds.